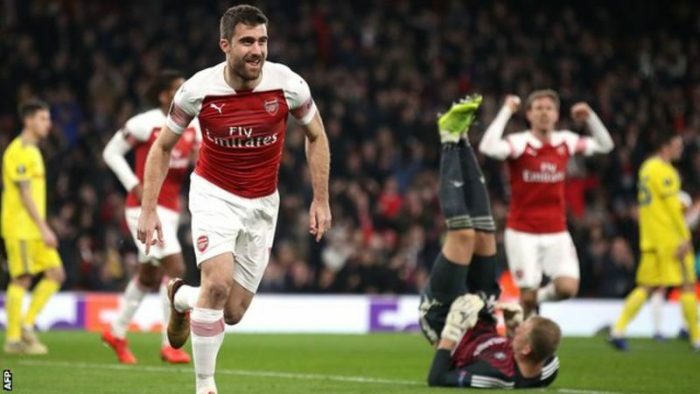 Arsenal booked their place in the last 16 of the Europa League with a comfortable second-leg victory over Bate Borisov at the Emirates. Trailing 1-0 from the first leg, they scored inside four minutes when Pierre-Emerick Aubameyang’s cross was turned in by Bate defender Zakhar Volkov. Centre-back Shkodran Mustafi made it 2-0 before the break with a powerful header from Granit Xhaka’s corner. The post [Goals Highlight] Arsenal 3 – 0 BATE (Watch Here) appeared first on Naijaloaded | Nigeria's Most Visited Music & Entertainment Website.